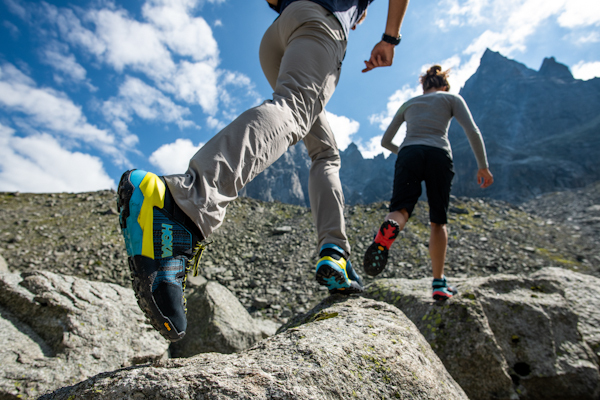 Home » Hiking & Camping » Will Hoka’s New Boots Change Hiking? In 2009, the running shoe industry was mesmerized with one concept: Minimalism. It was everywhere. Magazines gushed about the benefits of scaled-back running shoes. Christopher McDougall’s book Born to Run, which celebrated the barefoot and minimalist running shoe ethic, was on its way to selling three million copies. It seemed like you couldn’t run a mile without passing someone shuffling along in Vibram FiveFingers or Nike Frees. 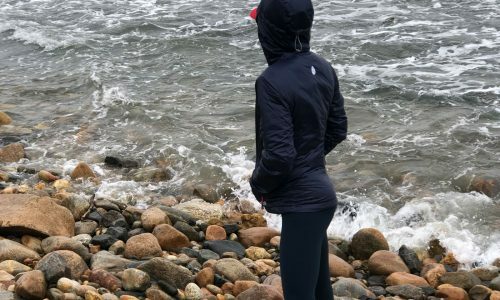 For those of us who were tuned in to running shoe technology at that time, it really felt like a revolution—a permanent, tectonic, paradigm shift away from thick, foamy “cushioning” shoes. Thick running shoes were, indisputably, dead. 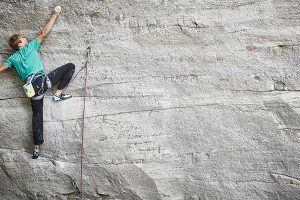 In the midst of the minimalist hysteria, one new company went brashly, even recklessly, in the opposite direction. 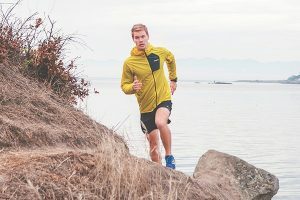 When HOKA ONE ONE unveiled its line of mega-fat, gluttonously thick running shoes at the peak of the minimalist trend, it elicited more than raised eyebrows among the running shoe cognoscente. As it turns out, they were. 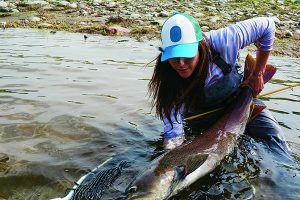 Reports began to trickle in on blogs and word-of-mouth from early-adopters. Mountain and ultrarunners praised their Hoka’s for the leg-saving cushioning on long runs and for their extreme low weight and quick turnover. Hokas began to dominate the startling lines of mountain ultramarathons. Soon, everyday trail runners began to warm to the deep-dish cushioning. The thick, light, smooth-striding technology migrated onto the roads and got picked up by mainstream runners—especially as troubling reports of injuries associated with minimalist shoes began to trickle in. It was the beginning of a renaissance in lightweight, “maximalist” footwear that has continued to this day, a movement is still all-but-synonymous with the Hoka brand. This spring, Hoka is trying to replicate its early success in a new space. 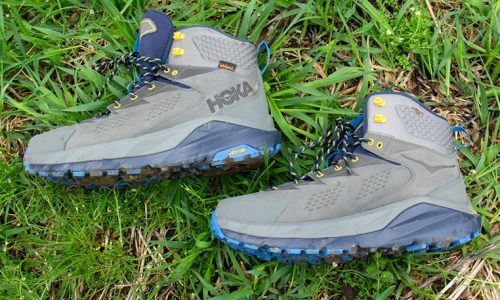 With the launch of its mega-thick Sky Series hiking and backpacking boots in spring 2019, the obvious question is whether the new Hoka boots can hiking the same way the company changed running? 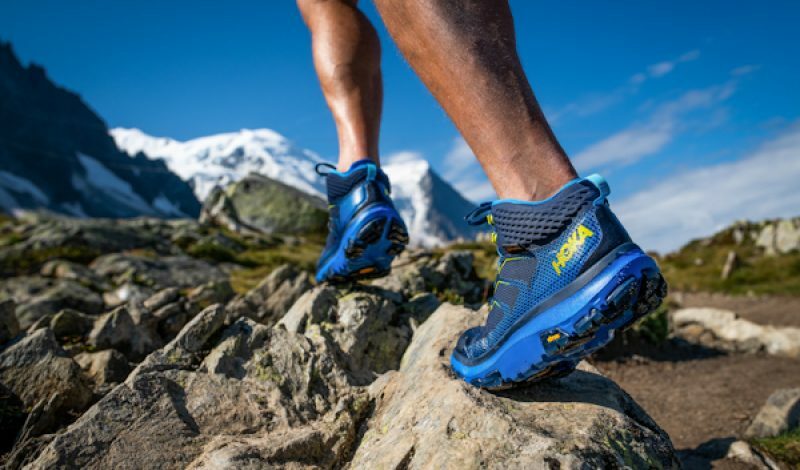 HOKA ONE ONE was created specifically because its founders hoped to eliminate the problems that minimalist shoes created for runners, especially those descending the steep, rugged trails of the French Alps outside the company headquarters in Annecy, France. Running down mountains means a lot of pounding on feet, joints and leg muscles. But Hoka’s beefy outsoles and thick cushioning significantly reduced the impact, while also making runners more comfortable on long climbs. Good foot protection, it turned out, worked well for both the relentless climbs and the grueling descents common to trail running. 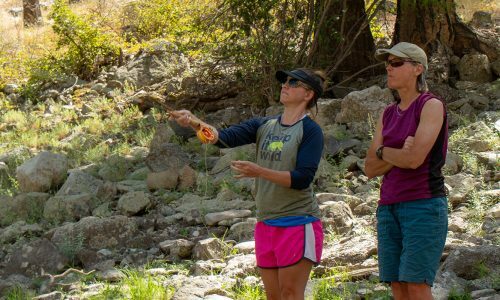 “Hoka was born in the mountains, and the mountains will always be a part of our brand,” said Gretchen Weimer, Vice President of Product at HOKA ONE ONE. 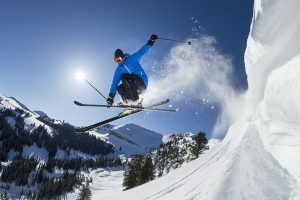 The initial designs for those 2009 running shoes pushed a concept with a proven history of success by designers of skis, golf clubs, tennis racks, and mountain bike tires. That is, oversized, wide-body designs can lead to better performance with a wider margin of error (a bigger sweet-spot, in the language of golfers). Hoka’s founders pushed that concept into their shoes, dubbing it the “maximalist movement.” Using lightweight components, the Hoka running shoes provided big, oversized protection and performance, while staying supremely light and comfortable. For Hoka, “maximal” cushion is not a philosophy, but rather a tool employed to help give athletes an enjoyable ride in Hoka shoes. With midsole volumes up to 50 percent greater than standard footwear, the shoes are designed to offer shock absorption, comfort, and support, and ultimately to make running easier for everyone. 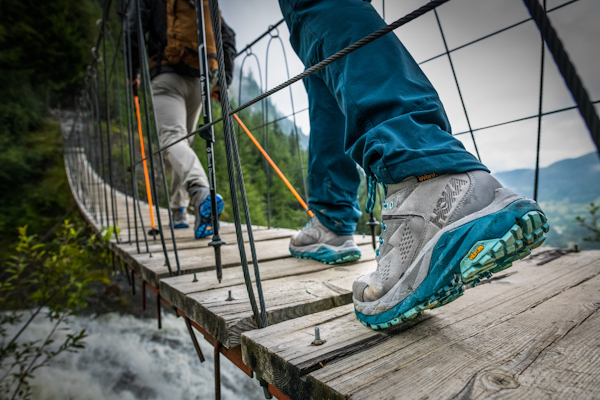 Ten years later, as we head into the spring 2019 hiking season, Hoka is attempting a similar shake-up in the hiking world. In many ways, it’s deja-vu all over again. The dominant trend in hiking shoes these days is—you guessed it—minimalism (couched, in backpacker-speak, as “ultralight” hiking). 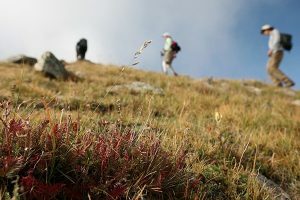 Trail enthusiasts from day trippers to PCT thru-hikers have adopted ultralight trail runners as their hiking footwear of choice over traditionally heavier, stiffer hiking boots. 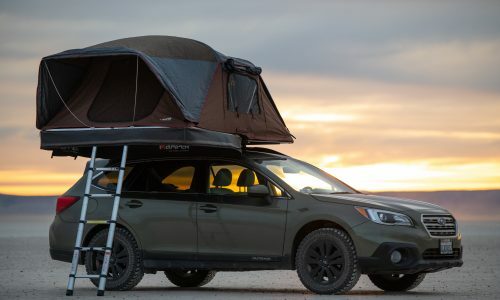 The theory promises better on-trail comfort and faster travel times. 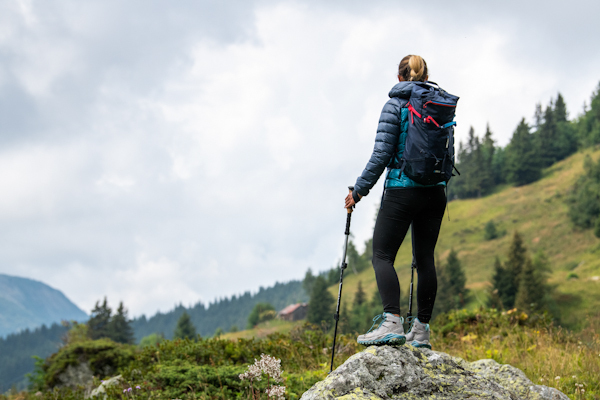 But just as the minimalist running movement failed to live up to its hype in many ways, this ultralight hiking trend has its pitfalls: thin, flexy footwear is downright exhausting on downhills, rocky terrain, long days, and under any kind of significant loads. 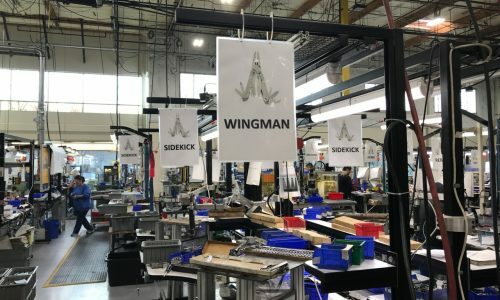 Hoka designers, sensing an opening similar to the one they capitalized on in running, started planning their entry into the hiking market in 2016. 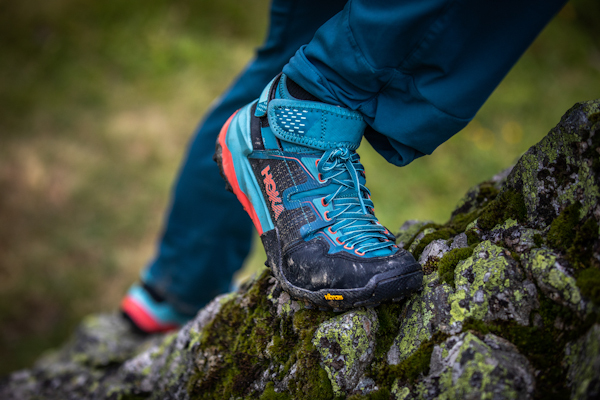 The new Sky series is rolling out with three hiking boot models, each tailored for a specific end use: scrambling, multi-day backpacking, and day hiking. 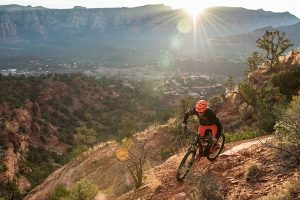 “We began by building trail running shoes, took those principles to road running and fitness, and are now returning to the mountains with hiking boots,” Weimer said. 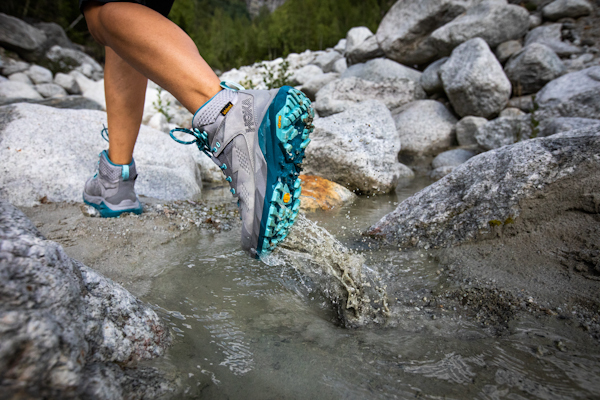 Within the new Sky line, the amount and responsiveness of the cushioning differ from boot to boot. 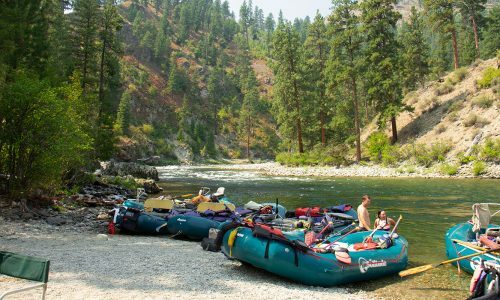 The Sky Kaha has the most cushion, since it is geared toward longer, even multi-day efforts. The Sky Toa sits at the other end of the spectrum in Hoka’s line, with 7mm less cushion under the heel than the Kaha, resulting in a lighter weight boot designed for day hikers and fast-packers. The insole of the boots are concave to create a kind of cradle for the foot, a feature Hoka calls “Active Foot Frame”, which is designed to offer guidance and stability on varied terrain. There is also a rockered shape to the outsole, dubbed “Meta-Rocker”, allowing for a smooth-rolling gait. 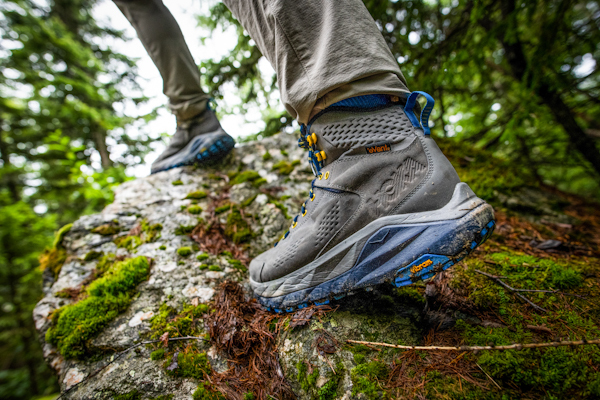 The uppers have real structural and support features, but the boots remain significantly more lightweight than classic boots with similar levels of protection. 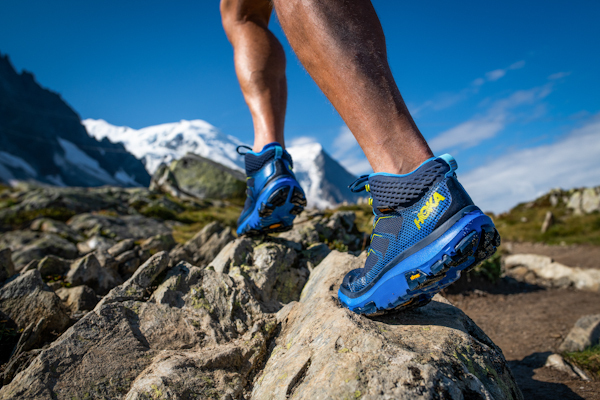 The new Hoka boots offer running shoe lightness, feel, and comfort, albeit with the protection and stability tuned for hiking. 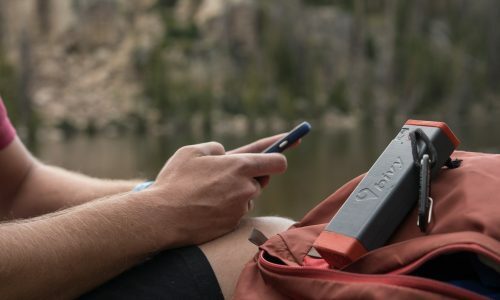 It’s a recipe that worked in running shoes, and we are eager to see how other backpacking brands—and hikers—respond. If you have impressions of the new Hoka Sky series, let us know in the comments below.